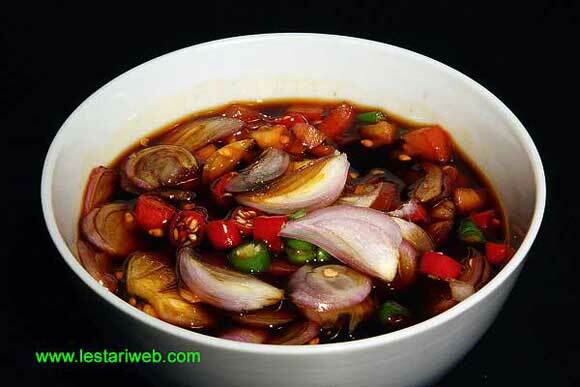 Sambal Kecap is a suitable companion for fried fish dishes or can be served as a satay sauce especially for those of you who're not too keen on peanut sauce. It is a very quick & simple home-made relish. Just chop & slice and Sambal Kecap is ready to serve!!. 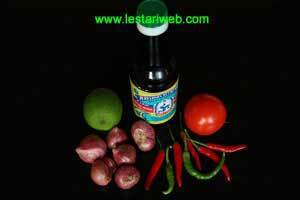 Actually there is no absolute recipe for making sambal kecap . You can set the amount of ingredients that fits to your taste and appetite. For those who like it spicy, just add the bird chilli as you desired. 1Wash and chop chillies & tomato. Slice the shallot finely. 2Put all the ingredients in a bowl. Add kecap manis until all ingredients are submerged in it. 3Add lime juice (if used). Mix all together & serve. TTipps: Prepare sambal kecap just shortly before serving and don't let it too long unconsumed because tomato provides a lot of water which later ruining the sambal's flavor.